I moved my financial portfolio to Redwood Financial in May 2015. From going through my expenditure and asking some pertinent questions – which meant I was able to cancel a number of obsolete policies saving me money I’d been unwittingly wasting for years, through to the handling of the transfer of my money from various sources, Nick and his team have been endlessly helpful and professional. Once everything was rationalised and sorted, Nick went through my old paperwork telling me what I could throw away (I’d had paperwork I’d been clinging on to for years not knowing if it was safe to discard). Whenever I’ve had queries or concerns, Nick has been quick to deal with them and allay my worries. He insists on meeting me (and all his clients) at least once a year which gives me great peace of mind knowing that someone is actually looking out for me making sure my investments are doing what they should (where previous IFAs I’ve used haven’t). 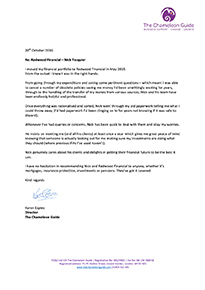 Nick genuinely cares about his clients and delights in getting their financial future to be the best it can. I have no hesitation in recommending Nick and Redwood Financial to anyone, whether it’s mortgages, insurance protection, investments or pensions. They’ve got it covered.